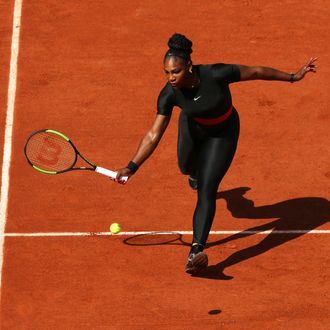 It may be almost 80 degrees and sunny in Paris, France, but that didn’t keep Serena Williams from wearing an all-black bodysuit to play in the first round of the French Open on Tuesday against Kristyna Pliskova. This marks the first time Williams has competed in a major tennis tournament since the Australian Open in January 2017, which she won while pregnant with her daughter. Last weekend, instead of training like everyone else, she was eating cake and living it up at the royal wedding. Unlike her opponent, who opted for a traditional tennis skort, Williams made yet another fashion statement on the court with her long Nike pants and bright red belt. (Williams has had a longtime partnership with the sportswear brand, and wore their sneakers to her wedding.) Many on Twitter noted that her look on Tuesday resembled that of Catwoman, the DC Comics superhero. All she was missing was the mask. I don’t know about you, but I’m inspired by Williams’s commitment to a goth aesthetic even in the summer heat. Last weekend, I went for a very easy bike ride in my winter darks and nearly died. I had to pull over on the side of the road and dry-heave near a bush. So, yes, Serena Williams is not only super stylish, but also super human. Serena Williams is on the scene of the French Open, but also suited up for the secret assassination mission later in the evening. This post has been updated to include Serena Williams’s Instagram.